A few days ago we got out hands on the first series of “The Newsroom” and we totally love it! From the start we notice some similarities to another favourite “The West Wing”, shortly after we spotted that both shows were created and written by Aaron Sorkin. 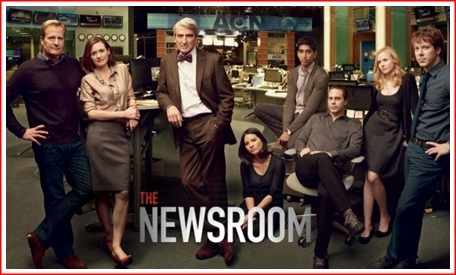 “The Newsroom” is an American political drama showing behind-the-scenes events at a cable news station. It is extremely well written, the cast are great and if you like TV dramas this one should be on your must watch list. Most of the time good shows have one of two elements – great cast or a great story line – this one has both. During the first episode of “The Newsroom” we had already started to care about some of the people working at Atlantic Cable News. And the story line… well it doesn’t look like fiction, you watch it and think, this actually could have happened somewhere…or at least you hope that it has. Jim Harper: Tell me about the complaint. Maggie Jordan: There was a desk producer who saw Will yell at me about something. Maggie Jordan: yes, Georgia the country. Jim Harper: during the invasion. Maggie Jordan: This isn’t about me. Jim Harper: You thought the Russians invaded Atlanta? Maggie Jordan: In retrospect it seems farfetched. Maggie Jordan: But that wasn’t what he was actually mad about. The wife of a board member died and Will asked me to send flowers. I wrote on the card, “I’m sorry about your loss. LOL”. Maggie Jordan: I thought it meant “lots of love”. Jim Harper: How are you still working here? If you think this is funny you should watch some more. Season two is on the air now and we cannot wait for it to hit DVDs. What’s on your Must See List? Could your dog run the country? I love The West Wing, it’s my number one favourite show in the world (currently coming towards the end of *another* rewatch), so I’ve been meaning to check out The Newsroom for a while. I think I might have to after reading your post! We are huge fans of West Wing too. Laughed at the quote because I used to thinkt he same hting about LOL. Or rather, I used to think it was stolen form the Dutch, where “lol” is the word for fun. I’ve never heard of this show. It sounds intriguing. My hubby watched this show for a couple of shows. We haven’t kept up with the series thou. My husband is all about these types of shows, I’ll tell him about it! I have watch and laugh with this show. Love it. Funny. My husband watches this show. He said Aaron Sorkin is writing it this season so it’s a little different than last, but he seems to like to watch it for fun. Past my bedtime now! Ha! or LOL! Sounds like a good show, I will have to check it out!